Request a Free Estimate We’ll Do The Hard Work, So You Won’t Have To! Grass Masters has been offering professional landscape services at affordable prices to the community for a long time now, and if we have learned anything, it’s that offering our customers the best customer service is as important as the landscape services we offer. 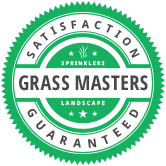 Grass Masters believes that every customer deserves a professional experience to ensure our clients are extremely satisfied with our work. Now we are improving our site to make it easier than ever to find and request the services you may need. We are always looking for ways to improve our customer service, and that’s why we have decided to redesign our website. It was time to put things in a better order and make it easier for you to find the services you need, and even easier to request services or estimates. If you can not find a service you are looking for, please contact us and let us know. We are always happy to discuss your needs and concerns, and we look forward to working with you! We want you to be thrilled with our service. If you are not happy with our service, we will come back and redo the service in question for FREE… If you are still not happy, we will refund your money and send you out to dinner to the restaurant of your choice on us! Our goal is making you delighted every time. You’re happy, we’re happy!